When federal judge Andrew S. Hanen, an Anglo in Brownsville, Texas, ruled on Feb. 17 that four million undocumented workers should give up the hopes inspired by President Obama’s plan to ease up on deportations, he was following a long precedent from his area. Racism in Brownsville set off fabled historical events in 1859 that are explored in Mexican author Carmen Boullosa’s new book. The historical events were the “Cortina Wars,” in which ranchero Juan Nepomuceno Cortina, whose family had owned all the land on which Brownsville sat, brought his ragtag army from Monterrey, just across the Rio Grande, to invade the city, twice! Boullosa’s book doesn’t claim historical accuracy, but uses an approach similar to “magical realism” to explore the people and the times. In her version, Juan Nepomuceno is the most fabulous man of the area. He’s accurate with his lasso, sure on his horse, and fast with his gun. Women swoon over him, every Mexican American man tries to emulate him, and every Anglo man despises him vehemently. After Nepomuceno has a racist encounter with a deputy sheriff, who was quick with his mouth but not so much with his hands, this great symbol of the rancheros has to high-tail it across the Rio Bravo. To be honest, Boullosa says that most people don’t care one way or another. But everyone who does care takes cover or takes sides. The reason for the strong reaction comes from the simple facts the book explains about the area. Because they could not completely overcome the Comanches, the Mexican government had allowed a certain number of Anglos to settle in their northern region. Of course, a lot more Anglos, legal or not, poured in, and soon they carried out the land-grab known on this side of the Rio Grande as the Texas Revolution. They claimed all the land extending southward to the Nueces River. 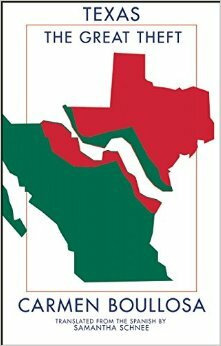 After Texas joined the United States, and when the Anglos wanted to grab more Mexican land, they claimed that the actual border was much farther south, at the Rio Bravo, which they called the Rio Grande. After provoking and winning the war, of course, they took not only the new southern border of Texas but also New Mexico, Colorado, Arizona, and California! The story of how the rancheros were driven out over the following 70 or so years is well documented. Carmen Boullosa has done us a great service, and provided us a marvelously good read, by speculating how real people might have reacted during the entire awful bloody period.